WASHINGTON – NASA unveiled new technology ideas for the future of space exploration in a series of panels this week that encourage the public to weigh in on where the space agency's limited funding should go. The first series of panels – part of a yearlong series of technology meetings – ran through today (Jan. 28). The series discussed 14 tech-related space topics, ranging from robotics, power and navigation to entry, descent and landing, including how to land on other worlds and asteroids. This is the first NASA technology roadmap meeting in which the agency has reached out to the public for ideas. "There are so many different technologies we would like to use, but we need direction – not just from NASA, but from the public and outside experts – about how to best prioritize tech advancements," Karen Thompson, chief technologist of the NASA's John F. Kennedy Space Center, told TechNewsDaily. "We have limited funding, so key decisions need to be made by the committee, with help from the public, about which technologies should be pursued." Future missions will send astronauts into space for longer periods of time, bringing them farther away from reliable logistics depots. One panel met to discuss how technology can help support human health and habitation in space, especially when astronauts are too far from Earth to return in an emergency. "Advancements need to be made for future space missions to provide crew safety," said Katy Hurlbert, an engineer at NASA's Johnson Space Center in Houston. "Systems should be developed and provided affordably, and require sustainability in extreme environments and for remote locations." The topic of air revitalization is also important for long-term space missions that must recycle their limited air and water. By increasing the recovery of oxygen from carbon dioxide, there could be a 75 percent oxygen recovery rate by 2014, experts said. A full oxygen recovery rate might be technologically feasible by 2019. Technology will also be needed to overcome challenges to crew health, such as an astronaut's psychological well-being in extreme environments and how to deal with limited communications from ground-based medical personnel for diagnosis and consultation as incidents arise. Although astronauts are screened for physical and psychological conditions now, conditions exist that current medical technology cannot detect far enough in advance, said Antony Jeevarajan, deputy division chief at Johnson Space Center. One panelist proposed that early screening technologies could be developed for potential dental emergencies and some medical conditions, from cataracts to individual susceptibility to radiation, sleep disorders and depression. Another field where technology development is needed is waste management. Right now, there are no in-flight laundry capabilities and food requires ground resupply. Over the next three years, NASA aims to implement more long-wear clothing and use 50 percent less food packaging. In the next five to ten years, bulk food processing could potentially be done in-flight and food supply could be augmented with plants grown in space. "New suit materials could also perform multiple functions, such as integrated power generation, injury and radiation protection, and be designed with decreased mass, improved mobility and self-sizing capabilities," Hurlbert said. Some major long-term challenges include real-time monitoring and forecasting of space weather. Radiation from the sun can vary in weather patterns and can also affect the performance of electronics on spacecraft. Right now, weather can only be predicted at most an hour in advance, but NASA hopes to expand this timeframe up to 24 hours in the next 15 years. Another more down-to-earth concern for the space agency is money. In particular, NASA faces financial challenges that could use innovative technological solutions. "High recurring costs are really impacting our space program. This is true ten years ago, it's true today and will likely be true tomorrow," said Greg Clements, also of the John F. Kennedy Space Center. He also said smart technology is needed to improve the safety of space travel. For example, the wiring used in many spacecraft is in need of updating. Wiring failures can cause catastrophic system failures, such what happened during a ground test for the Apollo 1 mission in January 1967 when an electrical spark from damaged insulation caught fire, ultimately killing the three astronauts inside the space capsule. "Tech enhancements will detect, locate, repair or mitigate an electrical compromise on energized 'live' wires during functional operations or 'dead' wires during maintenance operations," Clements said. "Once damage has occurred to a wire, it can be isolated by a re-routing device and then self-repair itself." Many speakers at the panel suggested environmentally friendly tech advancements. "The Environmental Protection Agency has issued new guidelines about what is harmful for the environment, and we have to comply with the new rules," said Thompson of Kennedy Space Center. "We need to protect the supplies and technology we already have. When we launch, materials form from solids and liquid fuels that cause acid to eat through the systems. New development needs to protect these materials." And layers of paint on some space systems could be hiding dangerous layers of corrosion, she said. Corrosion is a silent killer of the world's critical infrastructure and costs the world economy over $2 trillion annually, Clements said in his presentation. In fact, the total annual estimated direct cost of corrosion in the United States in 2010 was $578 billion – about 4.2 percent of the nation's gross domestic product. 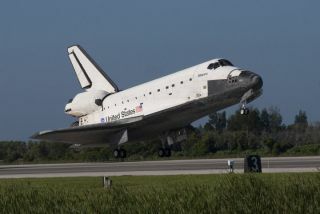 "For NASA, the degradation of structures from corrosion caused by exposure to high temperatures, humidity and the proximity to ocean has resulted in significant ground operations corrosion-related costs," Clements said. "NASA can achieve significant cost savings for the space program and for the nation as a whole by developing and implementing new corrosion prevention, detection and mitigation technologies that provide environmentally friendly, nontoxic materials to prevent corrosion." Today committee members will highlight high-level issues that arose within each panel and discuss potential plans for the future.